Quality home living is not defined by the structure that you live in – it’s the lifestyle that you lead that matters. Some of us who may be settling into our gold years or finding our way around the management of our illnesses know that maintaining a normal lifestyle can be difficult. At times, we need a different kind of care right in our own place of residence. This calls for personalized care by professional caregivers and aides. With this simple need for Home Care, Touch By An Angel Home Care, Inc. emerged to existence. We are a non-medical home based service provider, making programs available to clients who require companionship, homemaking, respite care, private duty nursing, and home health support in Boca Raton, Florida. These services can be available where you live and at a time when you need them. In its many years of service, Touch By An Angel Home Care, Inc. has established a brand that is reliable and committed towards the betterment of the clients we serve. We live to the promise we have made for ourselves and for you. 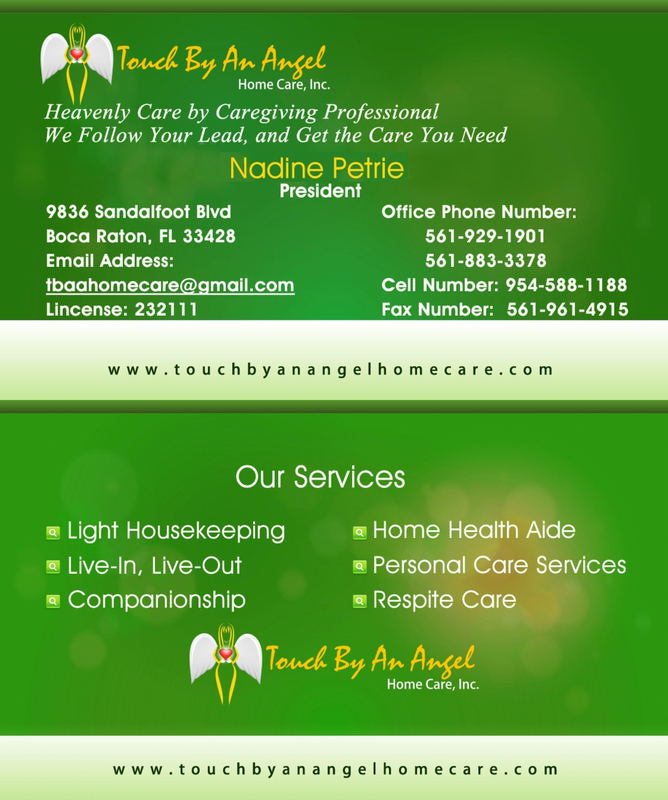 Touch By An Angel Home Care, Inc. is certified to practice home care in the state of Florida. This assures you that our role as caregivers is significant in managing your health. Let yourself enjoy the programs we offer. Thank you for viewing our website. We have included information for your review and we hope you will choose us to be your home care provider. For quick responses to your questions, please call us at 561-929-1901 or visit our office at Boca Raton, Florida. We are looking forward to serve you.